A TEME meeting at Tenbury to discuss mistletoe products matters for December 2006 – largely variants of the wholesale and retail mistletoe packs we produced last year, based on customer feedback and suggestions. But also to review other ideas, including mistletoe tea (and no it’s NOT poisonous – see Blogs passim), Spode and Royal Worcester mistletoe mugs etc etc. The Grow-Your-Own kit is due to be taken off the website for now – getting too late in the season to plant it – but I’m hoping to report on some particularly interesting sowings of my own soon. 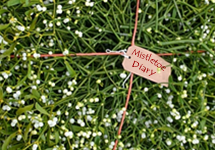 Yesterday I had some news about this year’s Mistletoe Festival – more on that soon as well.